This weekend I went to the Gukeng Coffee District to "camp" with some local families. I'd love to show you magnificent scenery and beautiful coffee plants, but it was much too hazy for decent scenery shots, and we sat around chatting and playing cards instead of charging about hiking and imaging. Very relaxing. The cafe next to the campsite offered wireless internet, too....as always, click on any pic to see its Flickr page. The day actually began in Tsaotun, south of Taichung, where I went to judge a speech contest at a local kindy. Snapped this hard-working fellow off to the recycling plant with his latest collection. We took Highway 3 down to Gukeng. 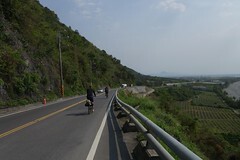 The campground was in the foothills right next to Jianfushan Amusement Park. The views would have been spectacular but for the haze that consumed all creation. Despite the unpromising weather, we took to camping with a will. My son leads a card game. Sunday morning the tents lay still. And crowded close together. Actually, they usually rough it.This time was exceptional, they assured me. Food awaits the early risers. Next door is one of the soil and water conservation bureau's activity centers. This exhibit preserves some old grinding stones, still geared, used in the old days in the sugar industry. The center also offered some excellent views, including that of the ferris wheel from the amusement park incongruously overlooking western Taiwan. A close up, in the foreground is a roller coaster. A coffee shop -- at $200 a cup -- is an inevitability in the Gukeng area. Rumor has it, though, that little of the coffee sold there is actually locally produced. My wife and I took a stroll around the lake in front of the Tzguang Temple, a gentle morning activity. After lunch we headed home. 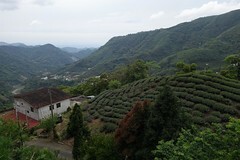 I took this shot of tea plants in neat rows as revenge for all the coffee kitsch. 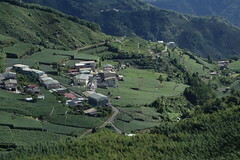 Although Gukeng is more known for its coffee, it is actually a center of pineapple production as well. Here we picked them up at low prices. Sign of the rising price of metal: One of my neighbors is an artist who works in various metals. This weekend he surprised a thief attempting to make off with some metal which he had kept as parts for his work. The thief had stolen one basket and was surprised when he came back for another. The first basket was not recovered, alas. Former Democratic Progressive Party (DPP) chairman Su Tseng-chang (蘇貞昌) dismissed media speculation yesterday that he would run in the election for party chairman in May. Su was not the only senior party member to show a lack of interest in running for the position. Others whom media had speculated could be interested in the position but who rebuffed the rumors include Vice President Annette Lu (呂秀蓮) and former DPP chairman Yu Shyi-kun. Su told reporters outside his residence yesterday that he would not run in the race on May 25, nor would he strike alliances with any individual or faction within the party. "The most important thing at the moment is to respond to the people's [wishes] and learn from them," he said. "We should not be concerned with fighting for positions. I don't think Taiwanese want to see that." The party's charter stipulates that the head of state should lead the party when it is in power and that party members should directly elect the chairman when it is in the opposition. It should be noted that Su might be playing coy, waiting for that "invitation." Remember when Ma Ying-jeou was out of politics and had to be "begged" by his father to re-enter and run for Taipei mayor? DPP legislative whip William Lai (賴清德) said the caucus had started work on creating an ad hoc group that would push for structural reform within the party and serve as a platform to ensure a smooth process. Over the next week the caucus will solicit the opinion of its members, other DPP members, party supporters and the public on the reform plans and a proposal could be drafted before the next DPP caucus meeting scheduled for April 11, Lai said. During a DPP caucus meeting on Friday, DPP Legislator Pan Meng-an (潘孟安) said in a written statement that the party should revert to the basic political line that defined it before it came to power, Lai said. DPP Legislator Yeh Yi-jin (葉宜津) said the DPP should address the problem posed by figurehead party members and consider building a system to regularly recruit and nurture party members, Lai said. "Figurehead party members" referred to above would appear to be party members kept by local factions affiliated with the DPP for the purpose of vote buying (sometimes known as nominal party members -- 人頭黨員). More importantly, the DPP legislator observes that the DPP ought to consider building a system for recruiting and nurturing party members. Yes, you read that right. At the moment, the DPP does not have a party machine that scoops up people, especially young people, and brings them into the party. The KMT has many avenues, from the China Youth Corps to the farm, fishing, and irrigation associations, to informal social groupings such as clubs and other associations. The KMT's Leninist background gives it a huge advantage in mobilization over the DPP. However, many actions and statements of KMT legislators since Ma's victory Saturday have already sent chills down the spines of Taiwan citizens concerned with protecting our hard-won human rights. The most disturbing example is the call issued by KMT lawmakers for the minister of national defense to "swear allegiance" to the president-elect even before Ma is inaugurated May 20. We applaud the decision by Defense Ministry's Tsai Ming-hsien, Taiwan's first truly civilian defense minister, to reject the demand for such an oath which are only common in personal dictatorships or one-party authoritarian states. The demands for a declaration of personal allegiance to Ma Ying-jeou were not raised by Ma himself, but, apparently without any sense of historical irony or shame, by KMT Legislator Chiang Hsiao-yen, the illegitimate grandson of the late KMT dictator Chiang Kai-shek, and other right-wing KMT lawmakers. For the United States, the clearest way of expressing that support is to give full diplomatic recognition to the state that already exists and that the Taiwanese overwhelmingly wish to preserve. Maintaining ambiguous, informal ties to Taiwan is confusing and potentially dangerous; it obscures Beijing's understanding of just how committed the United States is to Taiwan's defense and self-determination. Recognition would bring stability and certainty, thus actually lowering the risks that Beijing will misinterpret the U.S. position and threaten or actually commence military action to regain Taiwan. Extending diplomatic recognition would no more prejudice the U.S.' "one China" policy (itself an exercise in confusion and ambiguity) or the ultimate issue of reunification than did U.S. recognition of the two Germanys during the Cold War. The biggest concern now is Beijing's understanding of Taiwanese politics. It has wooed KMT leaders for several years and they have reciprocated. But if Beijing expects the new president to sharply alter course, then it is sure to be disappointed. Mr. Ma has said that "before we can talk about peace, we need to remove the threat," a reference to the 1,000 missiles reportedly arrayed against Taiwan. Mr. Ma has also promised to increase defense spending to about 3 percent of GDP. That does not sound like a man ready for unification. Fortunately, with the Olympics on the horizon, China will have little appetite for tension. Mr. Ma also reportedly wants to elevate relations with Japan. Japan overtook the U.S. in 2006 as Taiwan's second-largest trading partner: Two-way trade nearly reached $63 billion, and 2.3 million tourists were exchanged. While the KMT has traditionally been cool on relations with Tokyo, Mr. Ma is said to want to launch negotiations on a free-trade agreement. Those talks will be tricky: China is sure to take offense at any deal that appears to prevent reunification. Mr. Ma has his work cut out for him. But the scale of his victory should provide a solid foundation for his administration. Taiwan's voters appear to understand his priorities and appear ready to back a pragmatic agenda. Most significantly, the alternation of power — from KMT to DPP and back to KMT — is powerful reassurance about the state of democracy in Taiwan. Much of the logic in these centrist pieces is quite strange. While they all struggle to show that Ma isn't going to be Beijing's lapdog and paint rosy pictures of possible conflicts between Ma and Beijing -- think what the mere existence of such a discourse implies about what the reality is -- they all gloss over the fact that in order to accomplish his economic programs, Ma absolutely needs Beijing. The rise of the yuan may be the biggest single factor driving companies to relocate. But other government policies are contributing to the crisis. Last year, Beijing decided to cut or cancel tax rebates on more than 2,000 items used to make exported goods. The impact has been huge. "The end of rebates has raised the cost of manufacturing many goods by 14% to 17% at the factory level," says Harley Seyedin, president of the Guangzhou-based American Chamber of Commerce in South China. What happens is this: in many developing countries switching to an export orientation, tax rebates on stuff used to make exports is a very common policy, found in Taiwan during its heyday as well. Let's imagine I import steel to make toys for export. When I import the steel, I have to pay an import tax or customs duty. However, if I use that steel to make toys which I export, the government refunds me the import tax I paid on the steel. That way the cost of importing the steel isn't included in the cost of the product, holding production costs down. This also means that if I use the steel to make something sold domestically, its cost will be higher (all other things being equal) since there is no rebate on the steel, meaning that local consumers pay more than foreign consumers. The higher costs thus hold consumption down at home, increasing savings. Factoids of the day: A friend passed along J Michael Cole's observation that while Ma is always "Harvard-educated," Hsieh was never "Kyoto-educated." Future would-be presidents, take note! Here's something I didn't notice until last night. While the government announced that it had opened more than 6,000 cases of vote buying during the legislative elections, how many did you hear of during the Presidential election? In response, Hu indicated a willingness to reopen cross-strait talks on the basis of the so-called "1992 consensus," which stipulates that both sides concede separate interpretations of the "one China" policy. The "consensus" is not universally recognized as valid in Taiwan. Chinese Nationalist Party (KMT) Legislator Su Chi (蘇起) admitted in 2006 that he had invented the term before the transfer of power to the Democratic Progressive Party (DPP) in 2000. On Nov. 3, SEF informed ARATS of the oral expression about "one-China" it tabled being approved by the relevant leading department in Taiwan. ARATS agreed to the SEF's suggestion of stating the "one-China" attitude based on their respective oral explanations ina letter sent to the SEF on Nov. 16, but emphasizing both sides of the Straits persist in the "one-China" principle and work had to pursue reunification, without talking about the political meaning of one China in negotiations of affairs concerning both sides of the Straits. The SEF showed no disagreement in its letter of replyto ARATS on Dec. 3. Yes, Ma and Beijing are already on-script and ready to proceed. Since Ma must have an agreement with China so he can use Chinese money to jump-start the economy -- China set up a state-run sovereign wealth fund last year that seems ideal for this purpose -- the next line in the script is obvious. Since then, the KMT has developed into a concoction of ideological directions and policy orientations. In recent years, KMT conservatives favouring a return to the Chinese nationalism of the party’s founding fathers, have gained ground. Simultaneously, KMT lawmakers concerned with building personal support bases have increasingly opted for populist posturing – blurring the party’s traditional pro-business image. For example, Lee Chi-chu, a legislator now considered a possible choice for finance minister, took part in efforts to ground DPP attempts to privatise government banks and reform an overcrowded and underperforming financial sector. KMT legislators have also in recent years blocked most of the government’s planned weapons purchases from the US, with one protagonist – the former general Shuai Hwa-min – seen as a potential candidate for defence minister in Mr Ma’s cabinet. The past unruliness of the KMT has raised questions over whether Mr Ma will be able to control his party. “He is far too soft for our liking, and many of us had to swallow their hate before we voted for him,” says Chang Ling-chen, a professor of political science at National Taiwan University and a KMT conservative. Yesterday was all Elementary English day. First, I got invited out to one of the better local elementary schools near my house. It was the leading elementary school in its part of the world, but last year a horrible thing had happened: none of their kids had finished in the upper tier of the English storytelling and reading competitions at the county level, for the first time. This was absolutely mortifying for a proud school that dates back to the early days of the Japanese period, and being good businessmen, they swung into action and hired a consultant, none other than your trusty writer. That they would take such an extraordinary step shows how important such contests are to the self-image, and the public image, of the schools. They paid well, too. After I heard their story, I couldn't help but ask why they thought I was necessary, since it appeared to be a one-time thing. I suppose as a good consultant I should be emphasizing how much they needed me, but it was obvious they didn't. The English teacher had a wonderful faint trill to her English, and was vivacious and friendly, not to mention totally competent. My age (23 these many years), she had grown up in Argentina. She too felt I wasn't needed, but orders were orders....so we went to work. Part of the problem is that while the content is English, everything else is Sinified. The "right" way to do it is the way everyone else does it. The students present the stories using exactly the same intonation and movements as they use when they present Chinese content (what other model is there?). The effect is insomniac, especially reading, which should on no account be judged while sober. Further deadening effects come from the presentation guidelines, which permit no deviation from content, so no creative subversion of the story is permissible -- the three little pigs always kill the wolf, the enormous turnip is inevitably pulled up, and the gingerbread man never escapes from his bad end. So let it be written, so let it be done. Following destructive riots in the Solomons capital Honiara in April, the Australian and New Zealand governments criticised the Taiwanese government for engaging in chequebook diplomacy in the Pacific to win diplomatic recognition from small island nations. Taiwan and China's influence-buying in the region can undermine governance and encourage corruption and instability. Australia and New Zealand have told the rivals to stop the chequebook diplomacy to buy the allegiance of countries. Rioting in the Solomon Islands last year, which sparked Australia's billion-dollar RAMSI intervention, was blamed on Taiwan and China backing rival political factions in a tussle over whether the tiny nation continued to recognise Taiwan or to switch allegiance to China. Associate Professor Bill Hodge, a Pacific specialist at the University of Auckland, on Thursday said a pledge by Taiwan's president-elect Ma Ying-jeou to immediately end chequebook diplomacy could harm fragile Pacific countries that rely on the money. "It is an ominous sign for the economies and on government spending in these countries. In some, 80 to 90 per cent of the GDP is some sort of government spending," he said. Foreign Affairs Minister Stephen Smith this week said chequebook diplomacy was not a sensible way to proceed, and Australia's position had been made clear to a number of governments. A US Congressional report last year said Taiwan gave about $US10 million ($A10.9 million) in aid to the Marshall Islands annually, and since 1999 had given about $US100 million ($A108.7 million) in aid to Palau. In 2006, Chinese Premier Wen Jiabao pledged $US375 million ($A407.7 million) in development assistance and low interest loans to Pacific countries. This week, it was alleged that Fiji offered support to China's crackdown in Tibet because it recently secured a $F170 million ($A125 million) loan from the Chinese government to develop roads. Former Australian Foreign Affairs Minister Alexander Downer says the election of a new president in Taiwan could benefit the Australia-led assistance mission in Solomon Islands. Downer is in Taipei as part of an international parliamentary delegation to observe the island nation’s presidential election. Taiwan maintains direct diplomatic ties with Solomon Islands but its aid and grant programs have come under strong criticism from Canberra. Radio Australia quotes Downer as saying that president elect Dr. Ma Ying-Jeou has told him he wants to deal with Taipei’s “checkbook” diplomacy. Downer said under the Chen Shui-bian administration, there had been a lot of Taiwanese checkbook diplomacy in the Solomon Islands. Former Foreign Minister of Australia Alexander Downer’s comments that Taiwan deals with Solomon Islands on the basis of cheque book diplomacy are very unfortunate, says Prime Minister Dr Derek Sikua. Dr Sikua said Mr Downer’s comments demonstrated his continued lack of respect for the sovereign affairs of island conuntries in the region including Solomon Islands. “The bilateral relations between the Republic of China on Taiwan and Solomon Islands are based on mutual respect, understanding and genuine partnership and not cheque book diplomacy,” he said. He said Taiwan’s funding assistance to Solomon Islands is geared towards the development aspirations of the government and people of Solomon Islands. Of course, the reason The Beautiful Island has to engage in such noxious diplomatic practices is because we don't get the public support we need from the democracies like Australia. A specialty vehicle used at a fishing port in southern Taiwan. What's rolling across the blogs lately? A-gu has some caustic comments on the KMT's demand for a little time to get things in order. David on Formosa announces a new website: Images of Old Taiwan. Taiwan Matters has a long and detailed critique of the KMT move to pay off the local chiefs who were so valuable in getting them elected with foreign trips and increased salaries. 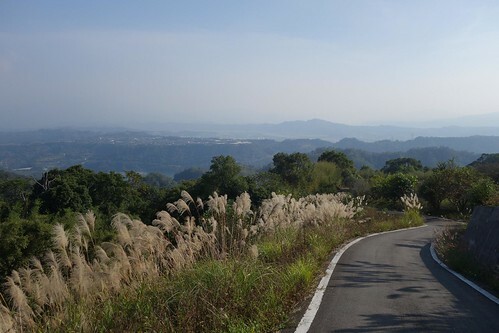 Taiwanonymous discusses the pros and cons of working in Taiwan. J Michael looks at Washington conservatives militarizing the Strait. Sure wish progressives cared as much as conservatives. My Several Worlds is master of its domain. Change your links accordingly! Taiwan Echo posts on Taiwan Matters! on the TIers and the language problem. The Taipei Kid finds some great quotes in a local English paper. Min, delighted that Ma was elected, gives a pro-Ma commentary. Holly talks about parents supporting their children into adulthood in Taiwan. Islaformosa explains to foreigners why Ma won. Portnoy at Global Voices Online has a translation of a post on racial discrimination in Taiwanese ads and other media. Fascinating. MEDIA: NYTimes says Taiwan wants to focus on building its own brands. The Economist has a good article on the election. John Tkacik at Heritage wants the US to rebuild ties with Taiwan. A UK paper has a good article on Central Bank concern over the way the influx of international capital may hurt Taiwan's export economy by driving up the NT dollar. It's only temporary, but indicative. Hillary Clinton's statement on the election here. HIGHWAY 11, the East Coast expat mag, the April issue is out. For good, for bad, depending on your point of view, Tonya Harding has been one of the most influential or perhaps controversial persons in Figure Skating history, and in all sports history, in notoriety, perhaps second only to Mohammad Ali. The US administration on Monday sidestepped questions about whether president-elect Ma Ying-jeou (馬英九) would be permitted to visit Washington before his inauguration in May, while some sources said that Ma may already have sparked a diplomatic incident by expressing his wish to visit Washington before informing the US or the Ministry of Foreign affairs beforehand. Yes, remember when Chen The Root of All Evil© Shui-bian was abused by Washington for going off without consulting anyone and upsetting apple carts all over the US-China relationship? My how soon we forget... but you can't blame Ma. US-China relations are a minefield. It is entirely laudable to express such a wish and I sincerely hope he gets a chance to follow through. Officials with the Defense Logistics Agency (DLA) sent four nose-cone fuse assemblies to Taiwan in August 2006 instead of four replacement battery packs for use in Taiwan's fleet of UH-1 Huey helicopters. The fuses help trigger nuclear warheads on Minuteman intercontinental ballistic missiles as they near their point of impact. It was unclear yesterday how the two very different items were mixed up at a warehouse at Hill Air Force Base in Utah and how they were shipped out of the country without notice. "Muggles!" blames expert. "They never notice when reality isn't normal." AP (Phoenix) -- Irma Levine, 58, of Austin, Texas, was leafing through her summer vacation photos of Hoover Dam again last week when she gradually realized something was amiss: there was no dam in the background. The next day, Levine alerted the Dept. of Homeland Security, which later that week confirmed by air reconnaissance that the dam was indeed missing. Yesterday at a Washington DC press conference, the Bureau of Reclamation, which is responsible for many of the nation's dams, admitted it had shipped the dam to Taiwan in error in a deal for some locally-made karaoke machines. "We have no idea why it took us 9 months to catch the error," said a Bureau spokesman. Taipei Times reporters learned today that the dam had languished behind a pile of plastic bottles at a Taipei recycling plant the whole time. First the mea culpa. I was totally wrong on the swing vote, as Forumosa poster Mick stopped by to caustically remind me in a comment that I lost (along with about 12 others in a Blogger error). The swing vote was about twice as big as I thought. More on that in a later post when the CEC gets detailed numbers out. I'm switching to Wordpress soon. Tired of Blogger. Tsai Chia-hung (蔡佳泓), an associate research fellow at National Chengchi University's Election Study Center, said that it was a myth that the south has traditionally been the stronghold of the DPP, at least not in the 2000 presidential election. Statistics showed that except for Tainan County, the KMT ticket of former vice president Lien Chan (連戰) and Vincent Siew (蕭萬長) and the independent ticket of James Soong (宋楚瑜) and Chang Chao-hsiung (張昭雄) together garnered more votes in Kaohsiung County, Kaohsiung City, Tainan City and Pingtung County than thee DPP ticket. In the 2004 presidential election, the ratio between DPP and KMT tickets in the south changed from 4 to 5 to 5 to 4 and in Tainan County from 4 to 5 to 6 to 3. Some media comments. The China Times discusses how voters chose a globalized Taiwan. The foreign press displayed its usual trends -- Keith Bradsher's backgrounder on Ma Ying-jeou is a hilarious puff piece that completely sanitizes Ma. And just for a historical note, BBC once again quoted Emile Sheng, the pro-KMT commentator, without noting his position. "But politically, we should not expect too much. The two sides need to build up mutual trust. Improved political relations will not be his first priority." Emile Sheng, professor of political science at Soochow University, agrees. Ma was widely touted by the media as the favorite, but he was certainly a very odd favorite. When the vote took place, three quarters of the party's legislators, many high-level party officials such as central executive committee head Chang Che-shen and more than 100 retired generals - the KMT is traditionally strong in the military - had thrown their support behind Wang. The party ruled Taiwan, often brutally, for 55 years until losing power in 2000. And all the stuff about the split between Ma and the southern Taiwanese legislators, the rivalry between Ma and Wang? Nothing. The KMT displayed awesome organizational unity. No criticism of Ma was breathed. At the local level sophisticated party networks knew exactly what was going on -- in our district the KMT reps knew how many votes they'd get -- to the exact vote at one precinct, and within 5 at the other. Raj said my description of the future below was too negative. He wanted to know what would happen in the next two-three years. That's simple -- always assuming that the US can prevent the subprime crisis from exploding the world economy, we're going to see a construction and real estate boom here. Construction and related stocks rose in the market on Monday. International capital backed Ma and they are going to want their reward now. Chinese money will also flow in. Many things might block that -- Chinese with $$ might prefer to invest it at home for higher returns -- which many already do, using the same Virgin Islands route that Taiwanese firms do. Or the US economy may implode. Oil prices, Taiwan's clinically insane land use laws....lots of things might turn out to be stumbling blocks. But I think Ma is going to move fast. The infrastructure spending he has planned to "save" the economy is contingent on obtaining stable supplies of gravel, and there is only one developed source ready and able to supply: China. How China will use that leverage remains to be seen. Incidentally, that neat little dirty trick the KMT played with former AIT director Doug Paal on Saturday, where they brought Paal in to speak "authoritatively" on the Green Card issue, illuminates some of the connections between international capital and the KMT: Paal is now a vice chairman at JP Morgan. Our day began, as every day should, with an all-you-can-eat breakfast. We headed out to Marine University in Keelung. The hills behind it are honeycombed with tunnels and carpeted with the works of successive colonial regimes: the Qing, the Japanese, and the KMT. This is what a hiking trail should be: easily negotiated. The day was unfortunately too hazy for good photography. 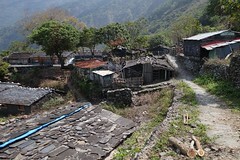 This set of structures dates back to the Japanese period and apparently remained in use under the KMT as well. As Michael observed, in the US, an area like this so close to a university would be carpeted in beer bottles and other paraphernalia of student partying. Not in Taiwan. ...was a fully clothed Michael Fahey. Very disappointing. It was like Mayan ruins. Alas, the haze wrecked the views. Many of the gun platforms and bunkers are in excellent shape. Jeff took us down a road, looking for a way across the valley. Plenty of goodies stacked by the road. ....where I found this amazing bee. 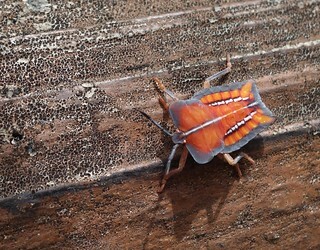 A closeup....with a bonus bug on the left that I didn't see until I blew the pic up. The eyes of the bee are wonderful. We bumped into a duck farm on the floor of the valley. "Is there a way out of the valley up the other side?" "No." And so we walked back up the hill, the ducks learning some useful, if socially reprehensible, English phrases from me. At the next set of military structures, we found some art students. One of the artists snapped me. An excellent state of preservation makes for mystery. On the way back Jeff explained how paper was made from the pith plant he is standing next to. The tree bark was literally unwound, and then dried. Because of its depth, the paper absorbed the ink, giving paintings a 3-D texture. We returned to the university, finding other families on the path. Lunch was obtained at one of the seafood places along the nearby roads. ...and we got off on the shrooms. In a sudden fierce burst of understanding, Michael attained enlightenment while contemplating Keelung Mountain near Jiufen. A slow day at the restaurant.